My first close encounter happened at the edge of a twisty road in the forested mountains of northwestern Burma, where wildlife photographer Karl Ammann and I had gone to find timber elephants at work. Our underpowered, overloaded car had for the last several hours been laboring up the road, turning and twisting until at some moment in the early afternoon we made a final turn and someone said, "The elephants!" The car pulled over at the roadside hamlet of Nyaung Chay Htauk—shade trees, a few bamboo sheds and shelters, some snacks and soft drinks for sale—where a small cluster of bystanders and onlookers milled around a small forest of gray-skinned legs and tails and trunks and torsos quietly gathered and swaying. We climbed out, stretched, and were greeted by the elephant doctor, a lean and bespectacled young man named Dr. Myo Min Aung. Then we turned to look at the elephants: three big adults and two babies about the size and shape of Volkswagen beetles. The adult elephants came complete with mahouts (or oozies, as the Burmese say): lean, jockey-sized men wearing simple cotton shirts and dark longyis, who sat with their legs wrapped around the animals' necks, their bare feet half-hidden behind giant, slowly-waving ears. The elephants seemed not so much indifferent, to the excited humans milling and chattering around them, as absent—as if they belonged to a different world. But then, after one of the oozies shouted something and kicked his feet inside the folds of a pair of gray ears, the owner of those ears came to life. She plodded slowly forward until she had moved right out to the edge of the road and stopped behind our car. She stood there: a big wall of gray with an eye near the front. Karl, meanwhile, had pulled a tangerine out of his pack and was now walking, fruit in hand, towards the elephant. "A gift," he said with some eagerness, and he held it out first in front of the creature's eye and then within reach of her trunk. Karl waited, then tossed the fruit onto the patch of road in front of her, just below the working end of her trunk. That tubular appendage curled, rose and arched and lowered its tip until it hovered right above the tangerine. The elephant inhaled through the trunk with a sniffing sound. She sniffed a second time, vacuuming up a trunk-load of scent molecules. Then, silently, the trunk curled up, and the animal shifted slightly, raised a foot, and lowered it slowly but decisively onto the fruit, which burst open and splattered its sweet juice onto the pavement. The elephant sniffed the fruit once again, but then showed absolutely no further interest, as if some fake person had just offered her fake food. Karl and I spent the next several days with her and a number of other elephants, riding elephant-back for two long days out to the logging operation, staying at a hut in the loggers' camp there, watching the elephants at work in the forest. Those huge and solemn creatures pulled enormous boles of hardwood timber down a steep mountain trail, then pushed and lifted and tossed the timber down a cliff to a dry, flat riverbed far below, where the machinery and trucks would be able to come and fetch. During those days and nights among the timber elephants of Burma, I learned several things. I learned that they are as sure-footed as mountain goats, steady on precipitous, switchback tracks, and reliable on precarious ledges, thus clarifying how Hannibal of Carthage surprised and alarmed Rome in 218 BC by crossing the Alps with an army and war elephants. I learned that when one foot of an elephant slips off the edge of a ledge, there are still three feet left to count on. I learned that when a baby wants to nurse, everything stops until the baby's finished. I learned that when an elephant rumbles, his or her entire body vibrates, from the bones on out. I learned about the size and feel of an elephant's tongue. I learned about the tension and respect induced by a giant animal who could, in a wild instant, pick you up and pop you open like a piece of fruit. 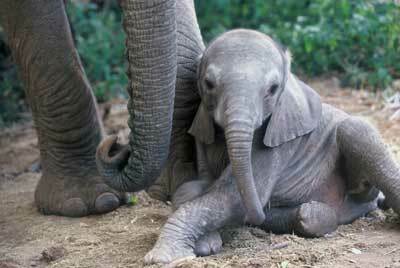 But mostly I learned something, a little bit, about elephant otherness: the alien quality of elephants. Later, as Karl Ammann and I traveled into East and Central Africa, by car and chartered plane, looking at and photographing the African savanna and forest elephants, the reflections I experienced in my first close encounter with the Burmese timber elephants began to seem commonplace, even forgettable—except for the almost inexplicable sense I had of elephant otherness. Indeed, that strange impression has remained and been repeated and reinforced with each later encounter. All species are alien to each other, you might say. We can only imagine the inner worlds, the mental and perceptual lives of dogs or apes. We can never fully understand them. But dogs will pay attention and let you know what they're feeling or what they want with a growl or whimper, a twist of the head, a wag of the tail. Apes will look you right in the eye, and, as with people, their eyes and faces are often a window into their minds. Looking into an ape's eyes and face you can read intent, interest, feeling. 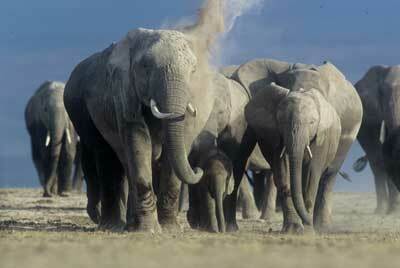 Elephants, however, are not obsequiously communicative in the style of dogs. And elephants' eyes, unlike the eyes of apes or other primates, including the human one, are not their most significant receptors. Nor do elephants signal much with facial expression; their faces tend to be blandly immobile and unexpressive. Elephants, it seems to me, are smellers, not lookers. They most actively take in information through the opening at the tip of the trunk, which is the single part of their body that appears perpetually animated, constantly sniffing, testing, assessing. There is a mystery about elephants that I'm not sure anyone can ever penetrate, though you might try to describe it in any number of ways. It's the mystery of what elephants think—using a brain three to four times bigger than ours. Or what they feel. Or what their interior world is like.